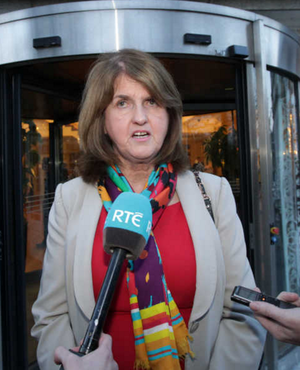 An 18-year-old man, who was found to have falsely imprisoned former tánaiste Joan Burton and her adviser in Jobstown in Tallaght three years ago, has won his appeal, after lawyers for the State said they would not be contesting the case. 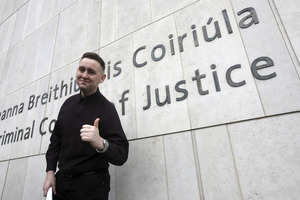 A judge at the Children’s Court in 2016, ruled [Jay Lester] was entitled to make a finding of guilty in the case against the teenager, who was 15 at the time, of the protests against water charges in 2014. The judge said he would leave the young man without a criminal conviction if he was of good behaviour for nine months. However, the man and his lawyers appealed the Children’s Court ruling to the Circuit Court. This morning, in a brief hearing, lawyers for the State said they would not be contesting the appeal. 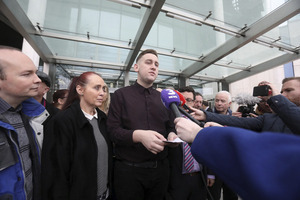 Jay Lester and mum Sandra address the media as Paul Murphy (far left), Solidarity/People Before Profit TD, looks on. Posted in Misc and tagged Joan Burton, Jobstown at 11:31 am on December 4, 2017 by Bodger. Fair play. Burton’s a disgrace, the whole Labour Party is. Scumbags. i disagree she was definetly held against her will – no matter how noble the cause that is wrong. as for the young lad , there were much better candidates for hanging that day than a 15year old. You should look up the definitions. There’s a difference between obstructing traffic (which is punishable under the Public Order Act) and actually imprisoning a person. If Joan was able to exit the car and get into another car, then she’s not imprisoned. It was her car that was blocked. The cops/DPP wanting to hit the campaign a hammer blow went OTT with Unlawful Imprisonment which can carry a very heavy sentence. You clearly haven’t seen the video; no way would I get be getting out of that car if I was her. And there is our friend in the blue hoody; well, I hoped that he learned his lesson and that in future he won’t allow himself to be manipulated by cynical older people who don’t have his best interests at heart. Hmm – well, looks like my comment was deleted. Sam, look up the video on Youtube (“Joan Burton surrounded by protestors in Jobstown, Dublin today”), and tell me if you would feel comfortable getting out of the car if you were in Burton’s position. Do you think Joan would have been safe if she walked through that (hostile) crowd on that day? If she felt that she would not be safe outside the cars, then she was effectively imprisoned within the cars. Those people obstructing the traffic were imprisoning her. So Snowey, you were there? Or are you relying on the video footage shown on RTE? According to the courts she wasn’t held against her will, do you disagree with the Irish Judicial system? 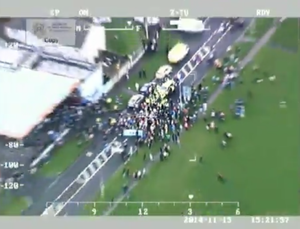 No need to rely on RTE’s footage – people can view the footage shot by the protesters themselves and arrive at their own conclusions. – that’s not what they said; they decided that they prosecution didn’t have enough evidence to convict any of the accused for falsely imprisoning her. Nice to see Jay walk. 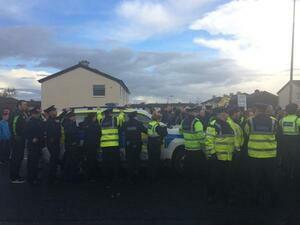 filthy political policing and nothing else. it wasnt political policing. the protesters were thugs, pure and simple. the good news is Murphy wont get relected as he does very little in the constituency. He’ll romp home you fool. He topped the poll in 2016 and won the by-election prior to that. If that was your mother, would you agree to her to be held up to that level of bile?